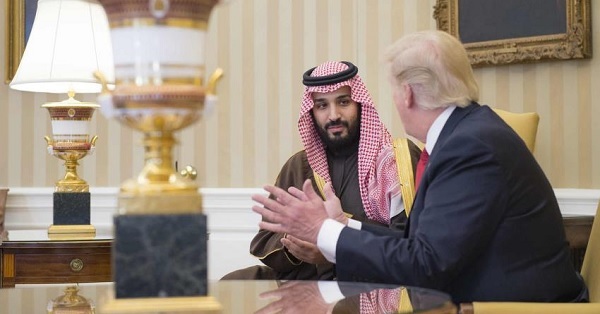 APN's Elana Kravitz in Times of Israel: "It’s Time for MBS to Step Up and Make the ‘Ultimate Deal’"
Mohammed Bin Salman was elevated to the status of crown prince of Saudi Arabia just over a year ago, and what a year it’s been. He quickly became an international celebrity better known as MBS, the man of the hour in the Middle East, and even a welcome presence on the Rock’s Instagram. He captured the world’s attention with a prolonged charm offensive and “revolutionary” reforms in Saudi Arabia such as allowing women to drive and disempowering the infamous Saudi Arabian religious police. But he’s also made some risky moves: a war in Yemen that has drawn criticism and led to a dire humanitarian situation there; a crackdown on “corruption” in Saudi Arabia that locked up hundreds of Saudi businessmen; a blockade against Qatar that, instead of putting the emirate in its place, has led the Qatari government to align more closely with Saudi Arabia’s arch-rival Iran; and a terrifying threat that Saudi Arabia would develop nuclear weapons in response to Iran that set the whole world on edge. As I see it, MBS can’t turn everything around, but he can certainly win support around the world and raise his profile by doing a better job of engaging with the Palestinian issue. He’s been trying to establish his leadership in the Arab world by taking on Iran, which has definitely won him some allies. But historically, Arab leaders have gained respect and prestige by advocating for the Palestinians and attacking Israel, even if these moves were only symbolic and rhetorical. In the new age of record Arab engagement, trade, and relations with Israel, this strategy makes less and less sense. Instead, MBS can pave the way for Arab states to engage in advocacy for the still-stateless Palestinians while also maintaining new and blossoming relations with Israel: he can advocate for Palestinians within the framework of a two-state solution with Israel. This may seem to be a dangerous move for a prince cozying up to American president Donald Trump and Israeli premier Benjamin Netanyahu. MBS recently went as far as to say that the Palestinians should “come to the negotiations table or shut up” and openly supported Israel’s right to “their land,” thereby furthering Trump and Netanyahu’s love for the young prince. But MBS doesn’t need to take such aggressive steps to curry favor with Trump and Netanyahu; he can create and maintain strong relationships with them without following their every whim and echoing their rhetoric. While Trump does want a deal that gives Israelis more of what they want, by advocating for the Palestinians and creating a deal they can actually get behind, MBS would be helping Trump achieve his dream of being the ultimate deal-maker. Patience and support for the Palestinian cause in the Arab world is finally wearing thin after decades without much progress towards a Palestinian state. And as Iran becomes a bigger threat, closer ties with Israel have become more important than condemning the “evil Zionist occupation.” But if no one in the Arab world supports the Palestinians’ national aspirations in the context of a two-state solution, then Trump’s peace deal push will fail miserably when Abbas is offered terms he simply can’t accept. Palestinians are also wary of the US’ role as a mediator in the wake of the embassy move to Jerusalem, so MBS’ involvement would both raise his status as a mediator and power broker in the region as well as help create a peace deal Palestinians can accept. And if MBS plays his cards right, he can help Palestinians achieve a state without hurting his newly-blossoming relationship with Israel. Sure, Netanyahu doesn’t seem to at all support a two-state solution, but he is limited by international pressure in its favor, and especially by his desire to keep up good relations with Saudi Arabia and the Gulf States as co-enemies of Iran. MBS’ father, King Salman, put Palestine at the top of the agenda at the Arab League’s conference this year. MBS has said that Saudi Arabia won’t fully normalize relations with Israel until the Palestinian issue is settled. This is his chance to help settle it, and to remake the Middle East with Saudi Arabia as the major player. Helping the Palestinians get a state would not only give Saudi Arabia immense political power in the region, it would also help MBS create a stronger and more unified front against Iran by officially bringing Israel fully into the picture. And, of course, MBS could become a widely recognized Arab hero. So, before Kushner and Greenblatt reveal their peace plan and ruin another opportunity for negotiations, maybe it’s time for MBS to start talking to Palestinians instead of telling them to “shut up.” It’s only a matter of time before Trump and Netanyahu’s policies kill the prospect for the two-state solution, and, along with it, MBS’ opportunity for heroism and leadership. This article appeared first in the The Times of Israel on July 11, 2018. Hard Questions, Tough Answers (June 19, 2018) - Trump’s Mideast peace emissaries are back in the region. So? Hard Questions, Tough Answers (October 17, 2018) - Who’s afraid of criticism?